Have you ever seen a healthcare worker wearing a procedure mask around his or her neck? A procedure mask is a disposable mask that protects the user from infectious droplets that can occur when a patient coughs, sneezes, laughs or talks. It is supposed be worn securely over the wearer's mouth and nose. 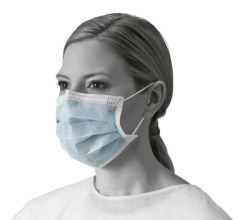 How about N95 respirators: have you ever see a nurse criss-cross the ties to make the mask fit better? An N95 respirator is a tight-fitting cover that protects the wearer from very small particles that float in the air, such as TB, measles, and chickenpox. It is especially important to ensure proper fit with N95 masks. The nose and mouth should be completely covered with a complete seal all around. Do NOT wear an N95 respirator that hasn't been properly fit tested. The association for professionals in infection control and epidemiology (APIC) has designed an informational flier to ensure proper use of respiratory personal protective equipment (PPE) by healthcare workers. We encourage you to share these fliers with your healthcare organization. RAECO Rents offers short-term rentals for respirator fit testing systems to ensure proper fit for each worker.